Welcome to the May edition of What’s New in AdStage! We spent the last month building a ton of feature enhancements in Report and Automate. Let’s take a look at the latest and greatest in Report and Automate below👇. Take any excel, csv, or google sheets data table you have and upload it directly to Report! Learn how to get started with custom table uploads here. Drop in your monthly opportunity and revenue reports from Salesforce into your cross-channel reporting views. Pull a campaign level performance report from your marketing automation system to see the landing pages or content driving the most conversions from your campaigns. Add in metrics from other channels, such as email, event, or organic social performance data. Customize your reporting views using Google Sheets to show data from your custom formulas. When uploading a table from Google Sheets, you'll always have the most recent data - no need to worry about data accuracy problems 🙌 . Give Table Uploads a Try! Now you can choose to view data from specific account groups, accounts, folders, campaigns, ad groups, or ads at the dashboard level by setting a ‘Data Source’. The data source you select in the dashboard settings, will now be the default level for any newly created widget. FAQ: How do I change my report settings on the dashboard level? With the ability to choose data sources at the dashboard level, we've also introduced a cleaner, more intuitive way to filter down to the data sources you want to see. The widget fields now have natural language making it easier to understand exactly which account groups, accounts, folders, campaigns, ad groups, ads, or keywords are most effective. Read how to filter performance data with new widget layout here. What does this mean for your reporting views? You can now choose to breakdown performance data by any level of your ad account to uncover deeper KPI insights from your reports. Now you can get an even more granular view of campaign, ad group, ad, or keyword performance within a specific Account Group or Folder for cleaner management and reporting views. We added the ability to see ad creative next to performance metrics, so you can diagnose which creatives are working, and what’s not, faster. Add an ad level table widget to your reports for a side-by-side comparison of winning headline, image, and description combinations. 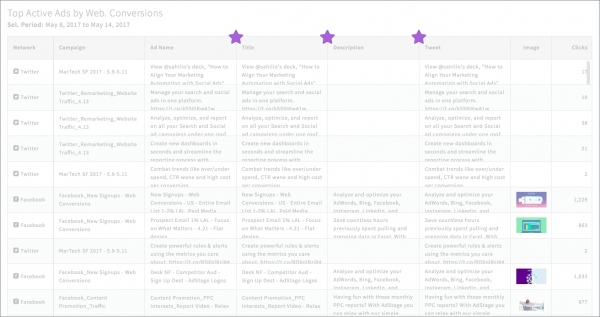 FAQ: How do I add headline, image, and description columns to my ad tables? Now you can show campaigns, ad groups, and ads in an ordered sequence to reach your target audience at every buying stage (resulting in higher CTRs and conversion rates🤑 ). Check out the full product update for getting started tips and Flighting templates! Now you can easily convert your existing alerts into rules to automate the same actions you’re already taking on your accounts after you receive an email notification. Your converted rule will have the same conditions as your alert, but now you can specify an optimization condition to apply once the rule is triggered. In other words, you can save yourself a ton of time on performing tedious management tasks. We always love hearing from you! Use the emojis below👇 to let us know what you think about the May product updates.